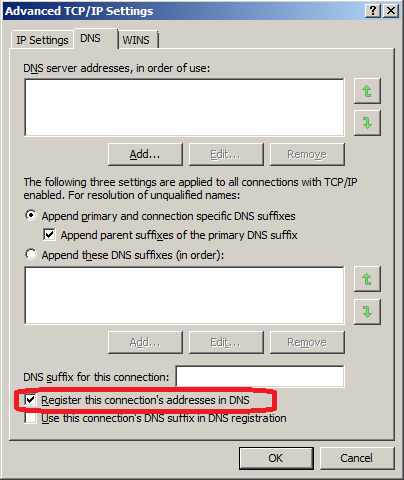 Not sure have you ever paid attention to the Windows default setting ‘Register the connection’s address in DNS’ for DDNS (Dynamic DNS) in the DNS tab within the IP V4 and IP V6 Advanced settings. If yes, then did you understand how it works? which service you assume does this job? DNS client? DHCP client? or something else? DHCP client: Manages network configuration by registering and updating IP addresses and DNS names. DNS client: Resolves and caches Domain Name System (DNS) names for this computer. If this service is stopped, this computer will not be able to resolve DNS names and locate Active Directory domain controllers. If this service is disabled, any services that explicitly depend on it will fail to start. DHCP client: Registers and updates IP addresses and DNS records for this computer. If this service is stopped, this computer will not receive dynamic IP addresses and DNS updates. If this service is disabled, any services that explicitly depend on it will fail to start. DNS client: Caches Domain Name System (DNS) names and registers the full computer name for this computer. If the service is stopped, DNS names will continue to be resolved. However, the results of DNS name queries will not be cached and the computer’s name will not be registered. If the service is disabled, any services that explicitly depend on it will fail to start. OK, you see it only uses DHCP client to update the DDNS in Windows XP/2003, but it starts to use both DHCP and DNS client in Windows 7/ 2008. In the article, it explains how Windows XP/2003 machine update their DDNS through DHCP client. I am eager to figure out how Windows 7/2008 machine use both DHCP and DNS client to update the DDNS. Unfortunately, I have not found anything about this on Microsoft website. Please let me know if you have any ideas.